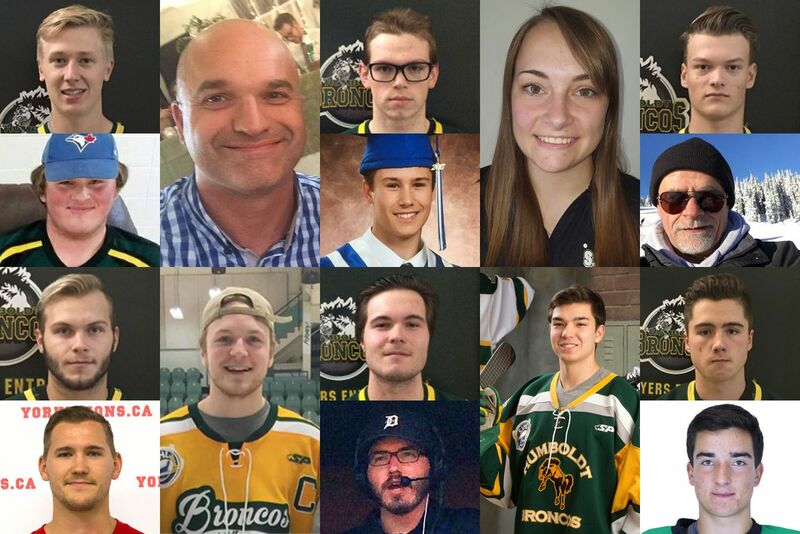 As of April 11, 16 people have been killed by the Humboldt bus crash. First column, top to bottom: Stephen Wack, Brody Hinz, Conner Lukan and Mark Cross. Second column: Darcy Haugan and Logan Schatz. Third column: Parker Tobin, Jacob Leicht, Jaxon Joseph and Tyler Bieber. Fourth column: Dayna Brons and Logan Boulet. Fifth column: Logan Hunter, Glen Doerksen, Evan Thomas and Adam Herold. Sixteen people are dead after a collision on April 6 between a Saskatchewan junior hockey team’s bus and a tractor-trailer in rural Saskatchewan. The death toll increased after Dayna Brons, the athletic therapist for the Humboldt Broncos, died. Her family said she was previously in a coma with serious head trauma. A 16-year-old player was among the dead, which included the coach, assistant coach, bus driver and a team announcer. The tractor-trailer driver survived. Here is what The Globe and Mail has compiled so far about the 16 people killed. The tractor-trailer involved in the crash belonged to a Calgary-based trucking company, Adesh Deol Trucking Ltd., which had its licence suspended. The semi-trailer driver is a 30-year-old man who just started working for Adesh Deol a month ago. He completed 15 days of training about two weeks ago, the company’s owner said. Two of the Humboldt Broncos players were initially misidentified, the provincial Justice Ministry announced April 9: Goalie Parker Tobin was killed and defenceman Xavier Labelle is alive, not the other way around, as originally reported. The coroner’s office apologized for the error and said it would review its identification practices. The intersection outside Tisdale, Sask., had been the site of another collision 21 years ago that killed six people. A fundraising campaign for the survivors and victims’ families became GoFundMe’s most successful Canadian fundraiser ever, raising more than $15-million in 12 days. The crash: On a Friday afternoon, the Broncos junior hockey team of Humboldt, Sask., were en route to a playoff game in Nipawin. Twenty-nine people were on board the team bus. 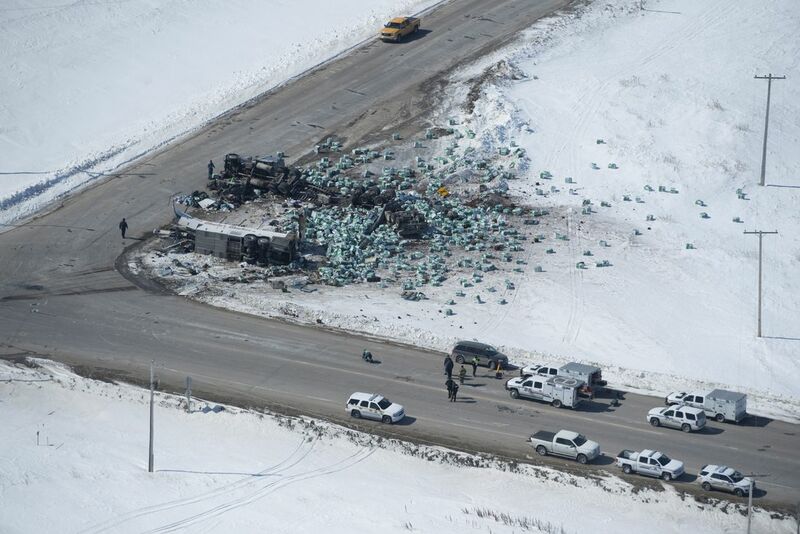 At the intersection of Highway 35 and Highway 335, about 300 kilometres north of Regina, the bus collided with a tractor-trailer hauling peat moss. Both vehicles were obliterated by the impact. The tractor-trailer driver, who worked for a Calgary-based company, was unhurt, and was given mental-health assistance after the collision, the RCMP said. Adesh Deol Trucking Ltd., which passed recent inspections and had a clear record aside from two tickets issued earlier this year, had its licence suspended — something Alberta Transport described as routine. The cause: The RCMP said on the weekend that it was too early to comment on the cause of the collision, or say if any charges would be considered. The intersection: Dubbed the Armley Corner, the intersection has been the site of a deadly collision before: In the summer of 1997, a couple, their three young daughters and a relative were killed in a crash there. When the Broncos bus passed through the intersection northbound on Hwy. 35, it would have had the right of way; the semi trailer, heading west, would have had a stop sign. The 16 people killed in the crash included many young players, their coach, a play-by-play radio announcer, an 18-year-old stats-keeper and a bus driver. Here is more background compiled by The Globe about them. 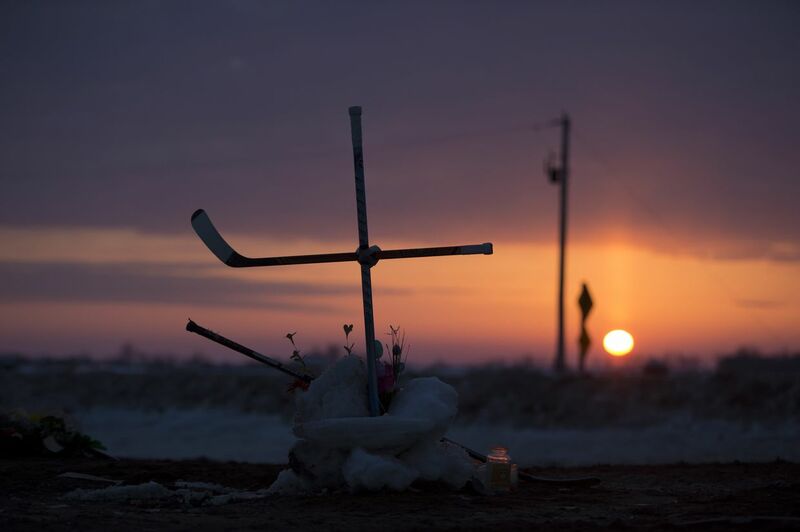 The sun rises on a cross made of hockey sticks, erected at the makeshift memorial at the intersection near Tisdale, Sask. Humboldt, population 6,000, quickly united in support of their lost loved ones. Flags were put at half-mast, residents wore jerseys and team colours and many gathered spontaneously at the Broncos’ home arena to pay their respects, comfort one another or just sit in the seats and look out at the empty ice. The Elgar Petersen Arena became a hall of mourning where residents gathered for a service on April 8. Among those in attendance were Prime Minister Justin Trudeau, Saskatchewan Premier Scott Moe and hockey broadcasters Don Cherry and Ron MacLean. The deadly collision led to an outpouring of sympathy and support from professional hockey players and organizations. The night after the crash, NHL arenas across North America held moments of silence before play, while Broncos stickers dotted the players’ helmets. This is a real-life story. It’s every parent’s worst nightmare. Anyone in hockey who goes through that stage where they ride the bus, later on they look back and talk about it being the best part. … You’re supposed to feel safe on the bus. For the Nipawin Hawks, the team the Broncos was facing off with in the playoffs, the most meaningful way to move forward was to get back on the ice. Later this week, the Hawks will play the Estevan Bruins in a championship final game, by a unanimous decision from the Saskatchewan Junior Hockey League’s president and governors. Donations have now closed on a GoFundMe campaign that, over 12 days, raised more than $15-million, making it Canada’s most generous GoFundMe campaign ever. Here’s some more background on how fundraising campaigns of that size are typically handled and what organizers’ options are for disbursing the money. One of the Broncos players who was killed, Logan Boulet, was an organ donor, and his death has sparked conversations among people wanting to become donors themselves. Editor’s note: Due to an incorrect news release issued by the Saskatchewan coroner’s office, a news story yesterday incorrectly identified Xavier Labelle as one of the Humboldt Broncos who died in Friday’s bus and truck crash. Editor’s note: A previous version described Ms. Brons as an athletic trainer. In fact, she was certified as an athletic therapist.